Finally, the Chicago Force accomplished its mission of winning a championship at Balboa Stadium in San Diego. The Force (12-0) won the national championship for the first time in team history with an 81-34 victory over the Dallas Diamonds (11-1) last Saturday night. “We’ve had a ton of success however everybody measures success by the number of championships you win,” head coach John Konecki stated. What a difference one year can make for the Force. Last year, the Force lost the title game to the San Diego Surge 40-36 at Heinz Field in Pittsburgh. One of the top players in the league is Chicago quarterback Sami Grisafe, who threw 49 touchdown passes this season to earn MVP honors in the National conference. Grisafe had another outstanding performance in the title game with eight touchdown passes. “We left no doubt that we are the best team in women’s tackle football,” Bache admitted. The Force jumped to a 21-0 lead in the opening quarter and were never in trouble with defenders Darcy Leslie, Jen Dulski, Angel Smith, Melissa Nelson and Kim Marks doing their job the rest of the evening. The Force extended its lead to 62-20 at halftime. Chicago has played at a high level on offense all season scoring 690 points to advance to the title game for the third time. “This is the best our offense has looked all year,” Konecki admitted. “We did it against a good team and a high quality opponent. We were hitting on all cylinders.” The Force was fantastic in postseason play scoring 276 points in four wins. Dallas entered the contest with one of the best defenses in the WFA as the Diamonds allowed only 20 points during the regular season with four shutouts. 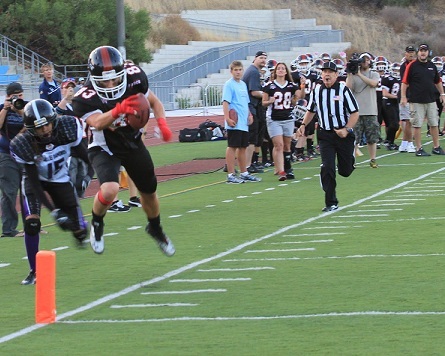 The Diamonds beat the Central California War Angels 27-6 in the American conference championship game. On this night, the best offense in the league prevailed over defense. Javelet joined the Chicago Force this season after playing for San Diego’s championship team in 2012. Javelet made an impact in the final catching 11 passes for 225 yards and four touchdowns. Jeanette Gray had 12 catches for 213 yards and three touchdown receptions. Grisafe and Javelet were named co-offensive MVPS in the championship game. Chicago overcame the loss of 2012 conference offensive player of the year Melissa Smith with a balanced rushing attack that featured Darcy Leslie, Mary Choules, Brandy Hatcher, and Javelet who combined for 1,700 yards during the regular season. Choules was the leading rusher for Chicago in the championship with 19 carries for 104 yards and 2 rushing touchdowns to go with one TD reception. The Force also changed its offense and defense this season with the results led to a championship. On offense, head coach John Konecki constantly changed personnel like a hockey coach while defensive coordinator Adam Lewandowski went to man-to-man pass coverage. The only question now is can the Force repeat in 2014? For now, the Force is happy to celebrate its first championship in team history. See the Windy City Times summary of the game for more photos!